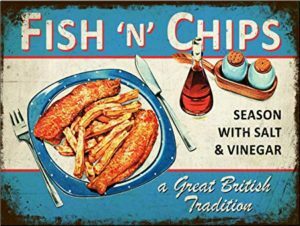 Is there anything truly healthy about good old British fish and chips with plenty of salt and vinegar? Well, yes, there is – although it would probably come as something of a surprise to most people – it’s actually the vinegar (acetic acid). And what’s more, research shows that vinegar is able to help in the prevention of type 2 diabetes (T2D). A 2013 study 1 looked at how strategies to treat prediabetes and the slow progression to type 2 diabetes are urgently and increasingly needed. Their research indicated that by simply making one small dietary change, namely, adding vinegar to meals each day, it was possible to reduce fasting glucose significantly – something of great significance to prevent the risk of developing type 2 diabetes. And its positive effect occurred within the first week of ‘treatment’ (just adding it to meals), and continued during the whole length of the 12-week study trial with no negative side-effects, unlike anti-diabetic pills. Additionally, no other eating patterns need to be changed. That is, if you’re still going to eat unhealthily, just adding a tablespoon of vinegar twice a day to your meals will produce the positive effects. 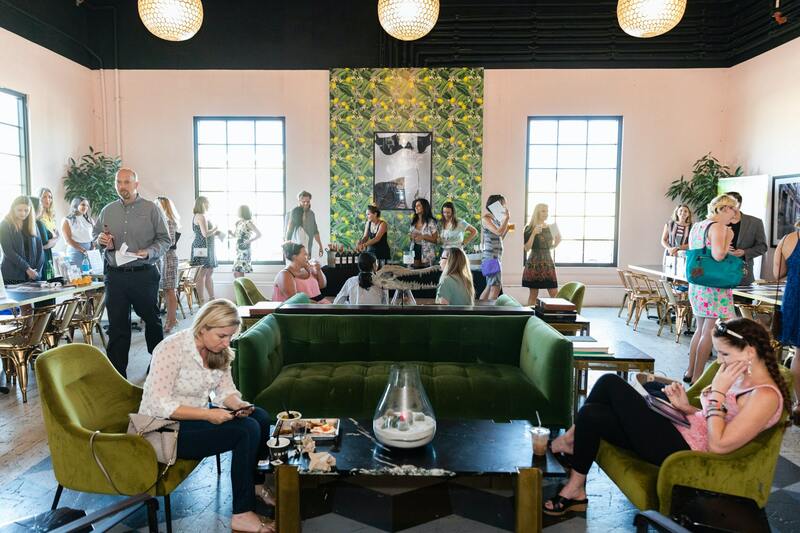 The 19 healthy individuals selected for this 12 week trial were identified as being either pre-diabetic or as having a fasting blood glucose measure of >5.55 mmol/l at study entry. They were split into two groups: one given a ‘vinegar pill‘ twice a day with meals, and the other given an apple cider vinegar drink with the two meals. The apple cider drinks each contained a tablespoon (750 mg) of vinegar, whilst the vinegar pills (Apple Cider Vinegar tablets, General Nutrition Corporation, Pittsburgh, PA) contained only trace amounts of acetic acid (40 mg/tablet) – basically a placebo. 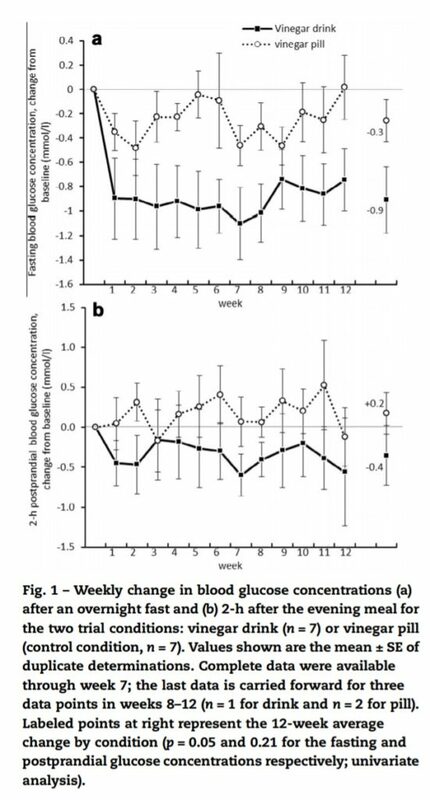 The average change in fasting glucose differed significantly between groups (0.91 ± 0.27 and 0.26 ± 0.17 mmol/l for the vinegar and control groups respectively). The results are shown in more detail in the charts below. is especially noteworthy when you consider the cost, access difficulties and toxicities associated pharmaceutical medications. Whilst this is a small-scale study, its findings appear pretty convincing. And it’s not an isolated piece of research. It’s also backed up by other studies 9 10 11 12 13 . For instance, there’s a 2009 study 14 , once again over 12 weeks and with similar amounts of vinegar, but with 27 participants who already had T2D. This time, the researchers were looking at whether a daily ingestion of vinegar at mealtimes may favourably influence (i.e. reduce) HbA1c 15 values in these diabetic participants . And the results? Indeed the vinegar consumption did reduce HbA1c when compared with the groups taking the placebo (a vinegar pill) and a pickled gherkin. The researchers concluded that the reduction in HbA1c was particularly impressive since the participants’ diabetic conditions were already being well controlled with medications. And it appears as though it’s not simply a matter of slowing gastric emptying or even of preventing glucose from entering the blood stream 16 . Rather, the reason why vinegar leads to significantly less sugar staying in the blood is because it leaves the bloodstream faster (that is, gets into the cells quicker). This ability to enhance sugar disposal by lowering insulin resistance (the cause of type 2 diabetes), as well as improving the action of insulin in diabetics, is well supported by studies 17 18 . Thus, the good news is that diabetics can tuck into potatoes – boiled, mashed or baked, so long as they add some vinegar. Interestingly, when diabetics eat high-fibre meals, the glycaemic response appears 19 not to be affected much (if at all) by adding vinegar – probably because the fibre is already so good at preventing glycaemic spikes. The ideal foods to add vinegar to are high glycaemic index foods such as white potatoes and refined grains – not that the latter are to be recommended when compared with purple/sweet potatoes and whole grains, of course. So, what’s stopping you? Any type of vinegar will do the trick – and we’ve listen a fair few previously 20 . Whether or not you’re overweight, think you’re prediabetic or actually have T2D already, this simple daily addition to your meals seems like a sensible move to keep insulin doing its job of getting that glucose into your cells.